When the familiar red spectral line of the hydrogen spectrum is examined at very high resolution, it is found to be a closely-spaced doublet. This splitting is called fine structure and was one of the first experimental evidences for electron spin. The small splitting of the spectral line is attributed to an interaction between the electron spin S and the orbital angular momentum L. It is called the spin-orbit interaction. 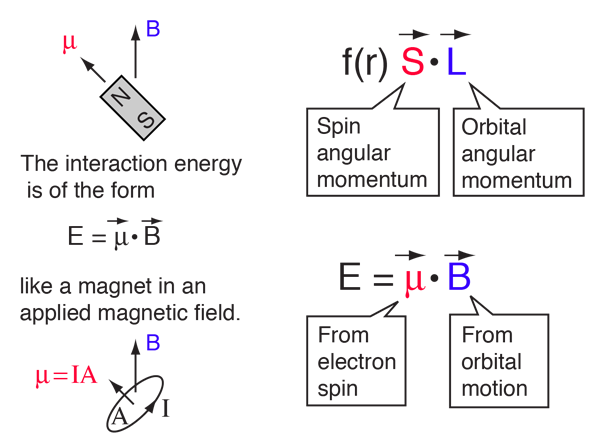 The familiar red H-alpha line of hydrogen is a single line according to the Bohr theory. The straight application of the Schrodinger equation to the hydrogen atom gives the same result. If you calculate the wavelength of this line using the energy expression from the Bohr theory, you get 656.11 nm for hydrogen, treating the nucleus as a fixed center. If you use the reduced mass, you get 656.47 nm for hydrogen and 656.29 nm for deuterium. The difference between the hydrogen and deuterium lines is about 0.2 nm and the splitting of each of them is about 0.016 nm, corresponding to an energy difference of about 0.000045 eV. This corresponds to an internal magnetic field on the electron of about 0.4 Tesla. When atomic spectral lines are split by the application of an external magnetic field, it is called the Zeeman effect. The spin-orbit interaction is also a magnetic interaction, but with the magnetic field generated by the orbital motion of an electron within the atom itself. It has been described as an "internal Zeeman effect". The standard example is the hydrogen fine structure. For a hydrogen electron in a 2p state at a radius of 4x the Bohr radius, this translates to a magnetic field of about 0.3 Tesla. This is fairly consistent with the splitting of levels observed in the hydrogen fine structure.